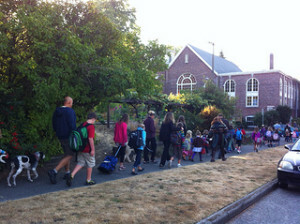 International Walk to School Month – Feet First Can Help! 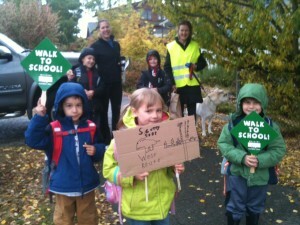 Every October, thousands of schools around the world get their students walking with IWALK Celebrations – how about you? With the last day of school just around the corner, next fall may seem far away. But this is the perfect time to begin thinking about International Walk to School Month, IWALK, 2014 . 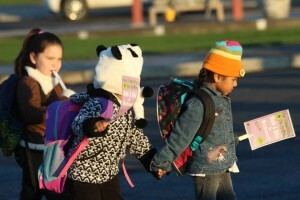 Last year, forty-two schools registered IWALK events in Washington State. Feet First challenges schools across the state to help us double that number by October! Access free assistance from Feet First by joining our IWALK Challenge listserv. You will receive summer-paced information and links to put you in good planning position for the fall. For inspirational IWALK celebrations, enjoy stories from across the state including our 2013 IWALK winners. Remember, IWALK celebrations can take many forms and often start small. All schools can find ways to encourage walking that best serves their community. From one day events to month long campaigns and from Walking School Buses to walking field trips, Feet First can help you find a way to celebrate IWALK.